NEW YORK, N.Y., March 17, 2014 – There may be 31 days in March, but for the plumbing community, one week stands out: Fix a Leak Week, March 16th- 22nd. WaterSense, a partnership program by the U.S. Environmental Protection Agency and creator of Fix a Leak Week, reports that household leaks can waste more than 1 trillion gallons of water annually nationwide. The holiday is meant to not only increase awareness of water conservation efforts and expand knowledge of best practices, but to emphasize the work the plumbing industry provides every day to meet these needs. Below, Dixon notes three products that are compliant with CALGreen, California's Green Building Standards, a landmark initiative mandating sustainability and conservation measures in new construction projects, requiring all new buildings to reduce indoor water usage by 20 percent. 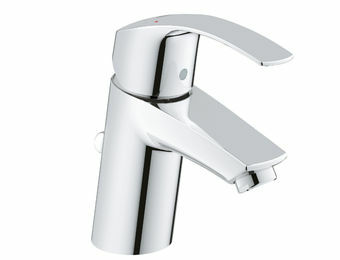 To view the full CALGreen range and to learn more about GROHE, visit them online at www.grohe.com/us. The Concetto kitchen faucet will bring many “oohs” and “aahs” your way, and leave guests thinking you spent a fortune on such a sleek design. However, the true price point won’t break the bank, and the transitional style element makes Concetto a nice complement to any existing kitchen decor. The added bonus of GROHE SilkMove® technology makes for easy one-finger control of both water temperature and volume, even with wet hands. Whether it is on major projects or in individual customer bathrooms, professional plumbers will appreciate the efficient installation of the newly redesigned Eurosmart line of faucets and fittings. “This is the best Eurosmart has ever been,” noted Dixon. 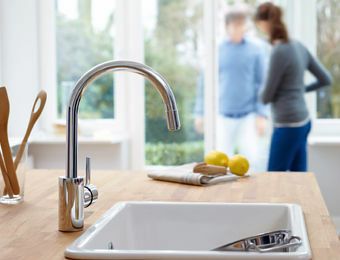 “We’ve modernized the design and added sustainable and innovative functions, like the new 35 mm GROHE SilkMove® cartridge, which features an integrated temperature limiter ring, allowing users to set how far their handle will swivel, thus limiting temperature and avoiding the risk of scalding,” she continued. In addition, by increasing the distance between the spout and the lever while raising the overall height of the faucet at the same time, operating comfort has improved by as much as 30 percent depending on the individual model. “Everyone’s shower preference is different, and GROHE recognizes and embraces that,” Dixon advised. 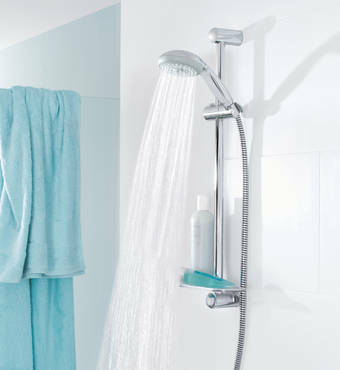 When it comes to variables like water pressure, spray pattern, hand shower versus head shower, the Tempesta line of shower heads and hand showers have something for everyone. At an unbeatable price, Tempesta incorporates the benefits of GROHE DreamSpray® technology, with an innovative silicon ring that wraps around the edge of Tempesta’s shower face to minimize damage to the bath tub or shower pan if you drop it. GROHE’s CoolTouch® technology creates a thermal barrier to isolate the surface of the hand shower from the hot water passing through it. Depending on the model, the hand shower also features up to four unique spray patterns, ensuring the ultimate in a customizable, relaxing shower experience. While you’re relaxing in the tub or singing out loud while preparing dinner, remember the work that goes into your shower and kitchen experience and take a moment to remember your plumbers and pay special attention to fix your leaks during Fix A Leak Week. For information on how to approach a leak, visit the WaterSense page here.